Cultural Heritage and Tourism in the Developing World is the first book of its kind to synthesize global and regional issues, challenges, and practices related to cultural heritage and tourism, specifically in less-developed nations. The importance of preservation and management of cultural heritage has been realized as an increasing number of tourists are visiting heritage attractions. Although many of the issues and challenges developing countries face in terms of heritage management are quite different from those in the developed world, there is a lack of consolidated research on this important subject. This seminal book tackles the issues through theoretical discourse, ideas and problems that underlay heritage tourism in terms of conservation, management, economics and underdevelopment, politics and power, resource utilization, colonialism, and various other antecedent notions that have shaped the development of heritage tourism in the less-developed regions of the world. The book is comprised of two sections. 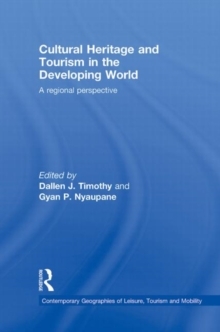 The first section highlights the broader conceptual underpinnings, debates, and paradigms in the realm of heritage tourism in developing regions. The chapters of this section examine heritage resources and the tourism product; protecting heritage relics, places and traditions; politics of heritage; and the impacts of heritage tourism. The second section examines heritage tourism issues in specific regions, including the Pacific Islands, South Asia, the Caribbean, China and Northeast Asia, South-East Asia, Sub-Saharan Africa, Central and Eastern Europe, the Middle East and North Africa, and Latin America. Each region has unique histories, cultures, political traditions, heritages, issues and problems, and the way these issues are tackled vary from place to place. This volume develops frameworks that are useful tools for heritage managers, planners and policy-makers, researchers, and students in understanding the complexity of cultural heritage and tourism in the developing world. Unlike many other books written about developing regions, this book provides insiders' perspectives, as most of the empirical chapters are authored by the individuals who live or have lived in the various regions and have a greater understanding of the region's culture, history, and operational frameworks in the realm of cultural heritage. The richness of this `indigenous' or expert knowledge comes through as each regional overview elucidates the primary challenges and opportunities facing heritage and tourism managers in the less affluent areas of the world.